The study, Data Protection Risks & Regulations in the Global Economy, asked more than 550 IT security and compliance professionals, involved with their companies’ global privacy and data security regulations, to weigh in on the top global security risks, as well as how prepared they feel their companies are to respond to a global data breach. The study found that more than half (51 percent) of companies surveyed had experienced a global data breach, with nearly 56 percent experiencing more than one breach in the past five years. 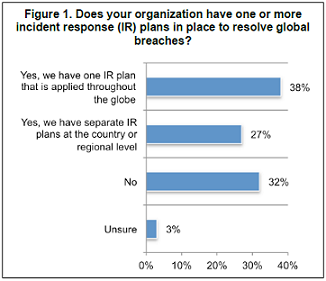 Yet, despite these major security intrusions, 32 percent of respondents noted that their respective companies still don’t have a response plan in place.